The Peugeot 108 has been given a mild refresh courtesy of some fresh colours, a new petrol engine and an updated infotainment system. On the outside, two vibrant new metallic paint options – Green Fizz and Calvi Blue – can be specified on Allure and Collection models. Allure models now get a contrasting Raven Black roof and gloss black door mirrors too. In the cabin, tech has been enhanced thanks to an updated 7in touchscreen infotainment system that features Mirror Screen, Apple CarPlay and Android Auto connectivity functions. The system is standard on Active trim level and above and is set apart by a gloss black trim surround. For an extra £480, Allure and Collection models can be fitted with a new safety pack that adds autonomous emergency braking system, lane-departure warning and traffic sign recognition. The 1.0-litre engine has been updated too, and now produces less CO2 than before. Producing 71bhp, it can be specified with a five-speed manual or ‘2-tronic’ automatic gearbox. Peugeot says the tweaked engine emits between 1g/km and 2g/km less CO2 than the outgoing model. Available to order now, the updated 108 costs from £9,225 on the road. 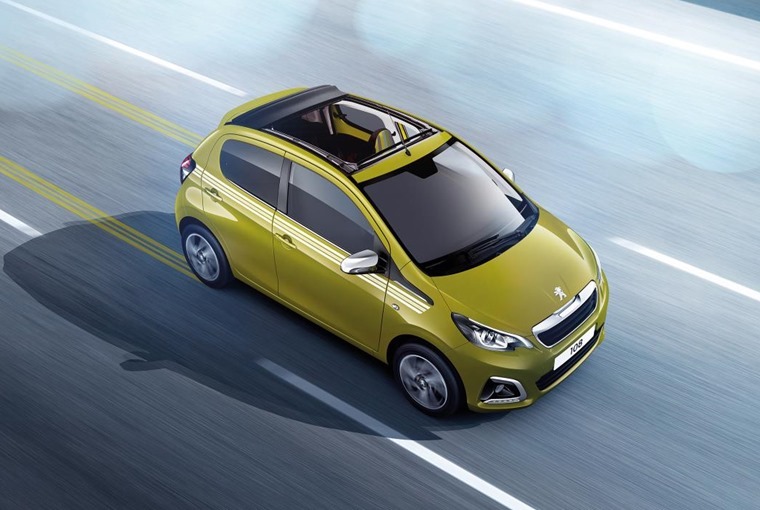 Peugeot’s city car is also one of the most affordable lease cars on the market – you can find hundreds of personal deals for less than £150 per month by clicking here.